How is layering in this area produced? What physical properties are involved? Which model – gabbro glacier, sheeted sill, or a hybrid – best describes this area? We returned to port back in February of 2013. Since then, the scientists who sailed were busy analyzing the collected material while Jean-Luc, Susan, and I were busy hosting workshops and other hands-on events to share this exciting experience with the public. Each expedition has a “post-cruise meeting” where everyone gets together to share the findings and collaborate on new ideas. The scientists who sail on the JR are required to publish an article about their research one year after the cruise. This meeting helps gather everyone back in to refocus. Plus, sometimes it’s just easier to sit in a big room to brainstorm rather than sending hundreds of emails back and forth all over the world. Usually, the education officers don’t participate in the post-cruise meeting. However, Susan and I were fortunate enough to attend this year. Thank you to everyone who made that possible! 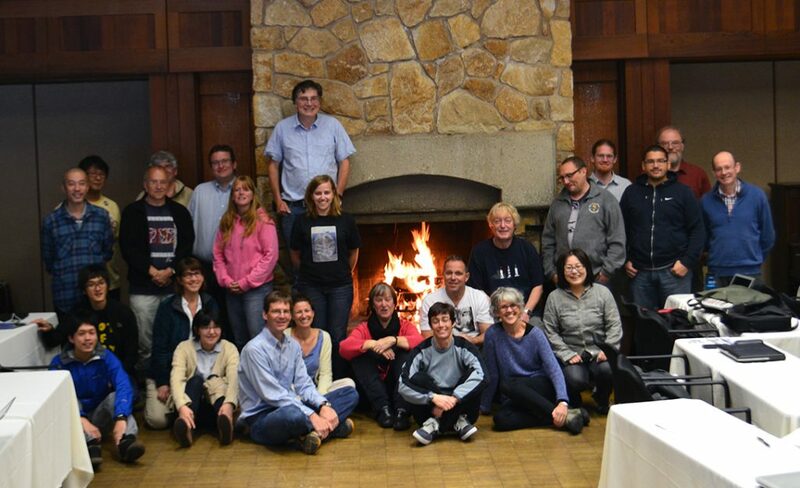 The meeting was held in Asilomar, California near Monterey. A beautiful spot on the coast with nearby national parks full of geological marvels! But, I’m getting ahead of myself. First we had to talk science. Each scientist gave a short presentation on things they found (or didn’t find) in the past year while analyzing the samples collected at Hess Deep. They have spent time in the labs comparing samples to quantify certain aspects of the cores collected. Michael Cheadle, a Structural Geologist on board, (and who I may add is an incredible public speaker!) examined the strength of crystal fabric in the cores and thin sections. He noted the variations in the alignment of the crystals, looking for the trends and patterns. All of these little differences offer clues, however…at this point the data is still in preparation. He’s got some hunches, but nothing definitive yet. One way Mike was able to examine the variations is through a process called ‘grain-tracing.’ This is exactly what it sounds like: they take an image of a thin section and trace the grains, or minerals present. By doing so, they can observe the shapes of the grains and how they differ from one section to another. To quantify his ‘hunches,’ Mike looked for clusters in the grains. Although the data is still being gathered, he mentioned that it hints at limited diffusion as a possible process and reason for the grain alterations. What continues to amaze me is that scientists are constantly playing games to figure out these things. They are only looking at the end result of a process and they have to figure out how things started and what changed in order to end up with what they have now. In doing so, they change one variable at a time and see what patterns emerge and what remains the same. They make predictions, then test, examine, and repeat. And after hearing everyone present, it is clear that this is a passion for everyone involved. Rather than getting discouraged when the results don’t mimic what they thought it would, they see it as a puzzle that isn’t solved yet. Romain Meyer presenting his findings to the group. After years of studying, scientists and researchers know some truths about the ocean crust. Using the data, they are able to take a conceptual idea and turn it into a concrete model. The more information gathered, the more cohesive the models and theories become. The most interesting aspect of this whole experience to me is how much overlap art and science have with each other. I did not study geology in college, so all of this information is new to me. But the process scientists use to figure things out is the same as the way artists create. Both professions examine and observe the world around them and ultimately take that information to produce tangible or conceptual…things to influence the world. Discussions, like this post-cruise meeting, are essential to compare notes to gain a better overall perspective and understanding because everyone brings personal insight and knowledge to the table. Without getting into too many specifics of the results (sorry, you’ll have to wait for the scientists’ publications for that) the overwhelming consensus is that things are much more complex that simple. Go figure, right? When you are working backwards and constantly revising, you probably won’t ever have the perfect answer. You take what you can, and go from there. This gave me an idea for a classroom project to explain these concepts. Take a well-known painting – the Mona Lisa for example – and cut a strip out of it. Think of the entire image as the ocean floor, and this strip you’ve cut out is like a core sample pulled up from the seafloor. Next, cut a section out from the strip. This is like the thin section. At this point, the ‘thin section’ part is so removed from the original image that it becomes an abstract shape in itself. Pass around these ‘thin sections’ to your students and have them examine the piece without knowing the big picture. Once your students have analyzed their ‘thin sections,’ put the pieces back together to form the large image. Unfortunately, scientists probably won’t ever get to see the ‘big picture,’ but they use their knowledge training to make the best-estimated guesses. After the science talks were done, we took a geological field trip down the coast of California. It got me thinking about how much of your interests are determined by your surroundings. I moved around quit a bit growing up, but spent a good portion of it in northeast Ohio. The closest mountains I had to see were on trips to Pennsylvania. But even still, those mountains were covered in trees. But being out here I can certainly see how inspiring the geology is! We visited a place called Jade Cove. The rocks in this location are called serpentinite, which is composed of a mineral called serpentine. This mineral is what the scientists have analyzed from the cores at Hess Deep. Of course, these rocks at Jade Cove been altered in a different way and are also composed of additional minerals as well. Serpentine is very easily deformed. And when mixed with these other materials (like jadite) it can create jade. This is also the reason why you can carve jade into sculptures. Pretty neat! I feel really fortunate to be able to communicate with this expedition crew. While on our field trips, we shared information about the structures and rocks as it related to our specialties. It was fun for me to learn about the different minerals and crystals we were looking at, and it was equally fun for me to teach the scientists about the effects of color and light on the crystals! A passer-by at Jade Cove saw all of us together and asked how we knew each other. I had to laugh at the only acceptable answer: We started as a group of complete strangers, who lived on the JR for two months straight, and have now formed into a tight-knit family. It was so nice to see everyone again, and I can’t wait for the future collaborations.